In Sydney, policemen are spotted patrolling on 2-wheeled scooters these days. The dashing vehicle is the latest electric self-balancing scooter, which was initially invented by the U.S inventor Dean L. Kamen and his company DEKA. Regarded as a groundbreaking invention which will bring a revolution to future transportation, the scooter has been recreated and modified through a decade into various products which are uniformly referred to as the “Segway” scooter. 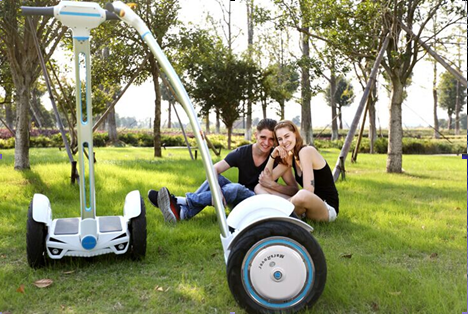 Airwheel S3 stages as the first “Segway” launched by Airwheel Technology, the intelligent transporter leader in China. Defined as the most intelligent and eco-friendly personal transporter so far, Airwheel S3 offers an ingenious solution to traffic and brings riders freedom and fun to get around town. The moment when you step on Airwheel S3, you’ll be instantly propelled by its potential motion to conquer the world and leave traffic far behind. Airwheel S3 features sportive and wild style inspired by Lamborghini and is powered by original Sony 18650 Li-ion battery which also powers Tesla. Airwheel S3’s internal design is highlighted by the dual drive systems, which ensure driver’s safety by shifting to the back-up once any malfunction is detected. In addition to dual systems, Airwheel S3 is protected by dual battery protection boards to extend life expectancy of the battery as well as reduce the maintenance rate considerably. Sophisticated as it appears to be, Airwheel S3 is convenient to set up and disassemble to facilitate carry-around. A video showing the U.S president Obama riding a self-balance unicycle to show guests around was subscribed worldwide, which rises a global sensation of the intelligent scooter. Nowadays, Airwheel S3 fuels the prevalence by making it affordable to everyone with its superior price-performance ratio. Airwheel’s products are hot among both distributors and customers since its first launch, and have built up a massive distribution network by entities spreading across over a dozen of provinces in China. Meanwhile overseas market plays an increasingly significant role in Airwheel's business strategy, which contributes tens of thousands orders from distributors based in the U.S, Canada, U.K, Germany, Austria, France, Italy, Russia, Australia, Brazil, Taiwan, South Korea, etc. With increasing awareness and appeals of environment protection, effective actions have been taken to bring about an new age of green transportation. The first step towards a greener and better era is to commute on a clean energy powered transporter, and Airwheel is the best option.